Developmental hip dysplasia is a condition that must be caught early. At the Chiropractic Coalface one comes regularly into contact with patients who have had less than satisfactory femoral head and acetabular replacement surgery. In addition, I personally have several patients every single day who are experiencing side of the upper thigh, not sacroiliac joint, and groin pain. 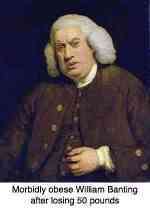 Hence began a long journey of self discovery about the hip joint. Prevention of hip arthritis is vital and DDH was not, in my day, something we learned about in Chiropractic School; nor was Femoro Acetabular Impingement Syndrome, DDH's first cousin. Both if poorly managed have a high predilection for hip arthritis. 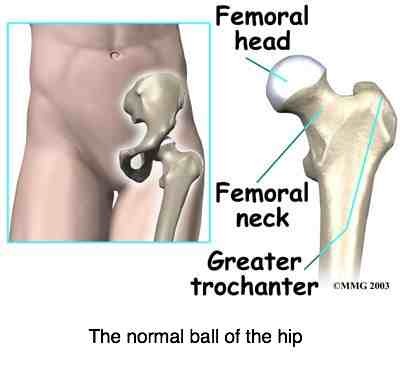 In the normal healthy hip the upper part of the femur ends in a round, smooth ball. "If left untreated, and the condition does not resolve on its own, the long-term consequences are very serious, including a shorter leg and a pronounces limp, with premature onset of arthritis and hip pain." Chiropractic Conditions is a central page at Chiropractic Help. It provides you simply and easily with the sorts of conditions that the average chiropractor would be treating. Healthy Living Tips is another vital page at Chiropractic Help. Sparkling good health is not just about having your subluxations adjusted. Our healthy living tips page gives you some insights into different foods you could and perhaps should be eating. 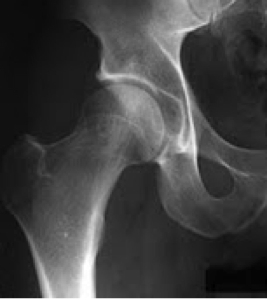 The normal hip joint has smooth outlines, a definite joint space, is well roofed and has no pincer or CAM deformities. Both the ball and the cup are lined with super slippery, hard hyaline cartilage so that one doesn't have bone on bone contact. The hip joints after all bear the full weight of the body. The joint is filled with a nutrient rich fluid that sloshes about supplying the cartilage with oxygen and all its needs for metabolism; it's living tissue, just as muscle, bone and nerves are. It has no blood supply of its own. Notice the position of the thighs in this normal vertex presentation... the "taylor's position" with flexed and ABducted hips. The ball is kept firmly in the socket. The space in the belly may be, due to various factors very limited (tight) and some babies show a range of abnormalities from a moulded head to abnormal feet, a congenital torticollis or stiff neck. Likewise Developmental Hip Dysplasia may occur if the knees are forced together, with a tendency to subluxate the hips. 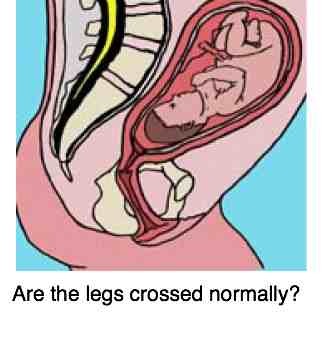 Thus it's vital the pregnant woman does not in the last trimester spend long hours sitting in a cramped position. Stretching out whilst lying, walking or swimming is essential, simply to make space for the developing infant. Whilst DDH almost certainly has an underlying genetic predisposition, scientists reason that the position of your babe in utero is profoundly important. Read further at our developmental hip dysplasia page; what happens in utero? How DISABLING is your Hip Pain? Notice, in the X-ray above, the deep socket and especially the very definite lower margin of the acetabulum. In the X-ray below of DDH, there is a shallow socket, with a sloping upper margin instead of a proper roof. In addition the lower margin of the acetabulum is barely seen. 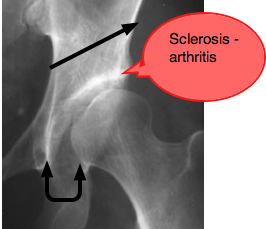 Developmental hip dysplasia often leads unerringly to severe arthritis if not well managed. Notice, in comparison with the normal hip above, how a much larger portion of the ball protrudes beyond the socket; it is un-roofed, and cannot contribute to bearing the weight of the body. The nett result is that the weight of the body is concentrated on a much smaller area of cartilage between the ball and socket, with far greater stress on the hyaline cartilage and underlying bone. Notice too, instead of a nice round ball, the flattened, 'mushroom-shaped' medial margin of the ball; this is a finding common to several hip abnormalities. 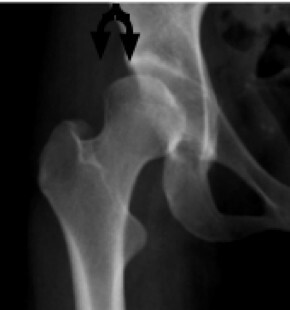 Notice again in the X-ray below the various features of Developmental Hip dysplasia. The sloping socket, the large unroofed part of the ball, the flattened femoral head, the wide margin in the lower part of the hip, and now, in this slightly older patient, the beginning of 'sclerosis' on both the roof of the socket and the ball. This is hip arthritis in the making. This patient already has pain in the groin radiating down the inner thigh muscles, pain on the side of the hip, and sacro-iliac joint pain. She also has short leg causing a tilted pelvis and a curvature of the spine. Undiagnosed Development Hip Dysplasia causes a leg length inequality. Take no positive action and there's a hip replacement waiting in the wings. It won't be long before hiking will become painfully impossible. If you take your colicky baby to a Chiropractor s/he will during the routine examination gently flex the hips, moving this way and that, listening for a deep-sounding 'thunk' as the hip subluxates. In fact whilst caring for your child, you too should listen out for odd sounds coming from the hip joints. Whilst only 1 / 1 000 babies (about 80% girls) have Developmental Hip Dysplasia, it's probably a much higher percentage of unhappy, colicky babies. In the clicking hip of the small infant, the diagnosis of DDH is confirmed with a ultrasound scanner which allows the radiologist to view the hip whilst it's in motion. S/he'll actually will see the hip subluxate as it clicks. 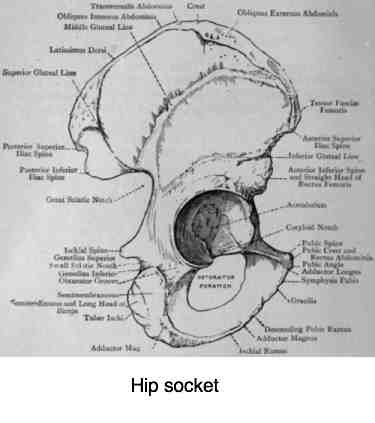 In serious cases the hip actually dislocates. That's a disaster. In mild cases it simply subluxates and clicks and becomes arthritic in later life. Your chiropractor, if s/he is experienced in the examination of the infant will be doing these tests, Hip Dysplasia Ortolani Galeazzi Barlow, noted orthopaedists to whom the world is indebted for their enormous contribution to the understanding of Developmental Hip Dysplasia. There is a strong genetic predeliction for Developmental Hip Dysplasia. 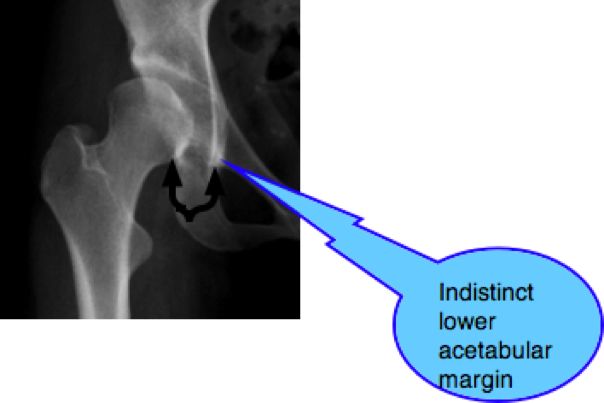 If Granny or Gramps had an arthritic hip, then every one of their children and grandchildren should be routinely examined for abnormalities like Developmental Hip Dysplasia (DDH) and Femoro Acetabular Impingement Syndrome (FAIS). Breech births increase the likelihood of DDH too, by a very large margin of ten. Now it's 1/ 100 babies. Add to that the effect of a constrained, tight intrauterine last-trimester, and a poor diet, and smoking, and we may be looking at 1/20 - 1/50 births. The treatment of the infant with DDH cannot be successfully achieved only with chiropractic. Your chiropractor would reduce the subluxation, but modern care involves an orthopaedic device called the Pavlik harness which keeps the head of the femur firmly in the socket. Why? Because in the newborn, the socket hasn't yet properly formed. It's the presence of the ball in the socket that builds a proper socket and to date that can only be done by successfully keeping the femoral head firmly in the acetabulum - that's what moulds the socket to the correct shape. I've been developing these exercises for several years, and am now ready to share them with you. They are tricky, be warned. Do them every morning before arising from your bed, and again before going to sleep. Obviously again during the day would be helpful. They take about two minutes only. So, I've split the exercises into three parts. Do part I for perhaps a week until you can do it confidently, and only then proceed to part 2. You've practised part 1 and can do it confidently? Right, you're ready for part 2. And now on to Developmental hip dysplasia exercises, part 3. Make this exercise routine part of your life and by reducing the tendency for your hip to subluxate, pop out, click, it will add years to the hip joint and save you a lot of pain; and perhaps a total hip replacement. The hip socket cannot be deepened, nor the ligaments easily shortened; all you can do is to strengthen the muscles that support the hip, and make sure the sacroiliac joint remains mobile and unfixated. It's widely acknowledged medically that Developmental Hip Dysplasia leads unerringly to hip arthritis and surgery. 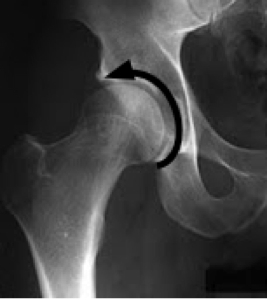 "Total hip surgeries may be inevitable later in adulthood." The rapidly growing infant places great demands for nutrients and oxygen on the mother. A diet rich in the healthy fats, protein, carbohydrate, vitamins and minerals, HEALTHY LIVING TIPS ... and of course ample oxygen. I know of no direct link like a lack of Folate and choline, or the smoking mother to Developmental Hip Dysplasia but that's probably simply because researchers haven't yet discovered the link. What is known, even worse, is that a deficiency causes birth defects. Of course, because of the prevalence of backache in pregnancy, WALKING BENEFITS ... are even more important. Are you enjoying this chiropractic site? Have you found this page on developmental hip dysplasia useful? 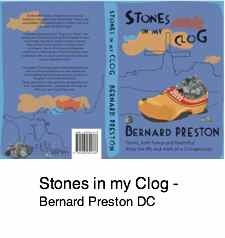 Then you'll love Stones in my Clog by chiropractor Dr Bernard Preston. Chiropractic stories from the Holland, light, interesting and fun; you'll find a tale there about developmental hip dysplasia and perhaps femoro acetabular impingement syndrome too. True tales from the Chiropractic clinic. Only $2.99 on your Kindle, tablet or smartphone. Find it at Amazon. Banting diet modified by including legumes along with animal protein. Banting diet modified forbids your high GI starches but not the healthy carbohydrate. Banting diet really does work but there are a lot of questions. Banting diet oddly may lower your blood cholesterol despite being a high saturated fat meal plan. It will certainly improve insulin resistance which is vital.